For those looking for ways to entertain their teens this holiday, a trip to Crystal Maze Live is sure to put a smile on even the grumpiest of faces, and ensures a bit of family bonding to boot. The new West End Maze arrives just in time for families to battle it out over Easter across the maze’s four themed zones, inside which are different challenges: skill, physical, mental and mystery. If your family counts a game-show addict, puzzle-lover or anyone nostalgic for the 90s, this one’s for you lot. If your little one has their head in the clouds, try getting up there with them with a trip to the top of the O2, who are teaming up with The Royal Observatory and the Cutty Sark this Easter to provide fun history experiences all while standing on top of the world. Local experts will provide curated lessons on Greenwich’s maritime past and present and the area’s significance as the home of Greenwich Mean Time. Those looking for a full day of historical fun can purchase a special Summit Series ticket which includes entry to either The Royal Observatory or Cutty Sark on the same day. Children must be aged 9 years or older to climb. This one sounds very exciting – an immersive ghost factory as part of Waltham Forest Borough of Culture 2019. 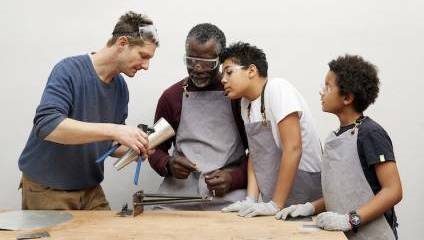 Celebrating Waltham Forest’s manufacturing heritage while teaching practical metalworking skills, the experience will see the kids clock in as factory workers before being led by performers through the mysterious Atomic 50 ghost factory into workshops past and present. Objects made by the kids will also be displayed as part of a finale sculpture. Suitable for children ages 7-11. Over in South London there’s fun for the whole family at the Horniman Easter Fair. Young and old can enjoy an Easter trail, craft workshops, storytelling, face painting and more family activities across the gardens – you certainly won’t be bored with the number of activities on offer. And while you’re there, why not check out their impressive Brick Wonders exhibition of world wonders made entirely from LEGO bricks. If there are any Narnia fans amongst you, head to Westminster Abbey this holiday, where you can learn about the mythical creatures that exist both in Narnia and the Abbey, and count how many Aslans you can spot as you explore. Little ones can also get creative by making a shield to fight in Aslan’s army and creating their own personalised keyring to take home. On the hunt for the Easter Bunny? Look no further than Lee Valley Park Farms this holiday, where alongside the Easter Egg Hunt Trail, which challenges visitors to find a prize hidden in and around the 17 acre family attraction using a series of clues, you’ll get the chance to meet the elusive Bunny too. After you’ve discovered your egg-citing treats, you can go and see the spring arrivals at the farm – try bottle-feeding a lamb, saying hello to a llama, or taking a ride on Tex the Tractor.